We are almost through April and graduation is just around the corner. To say this month is a blur is an understatement as the days disappear in the frenzy of Ag Week, student celebrations, Spring Fest, graduate thesis defenses, research poster sessions, exams, grading… We will celebrate the accomplishments of our faculty, staff, and students in InFocus next month, but I thought I’d use this month’s column to lift up some very special student accomplishments. As most of you know, the University recognizes one outstanding undergraduate man and one outstanding undergraduate woman from the more than 6,300 graduates in the May commencement. This year, both of these students are from the College of Agriculture. Laura Donaldson, an agricultural economics major, was named the Flora Roberts Award winner as the outstanding senior woman on the Purdue campus. Gabe Rangel, a biochemistry major, is the G.A. 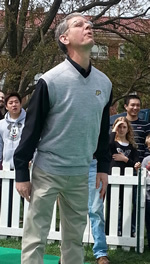 Ross Award winner as Purdue’s outstanding senior man. It is hard to overstate the significance of Laura and Gabe’s accomplishments – to be singled out for achievements in ‘scholarship, leadership, service, and character’ from the several thousand Purdue graduates this year means their accomplishments are truly extraordinary. You will read more about Laura and Gabe in an upcoming issue of ConnectionsNOW!. But, I am struck by the paths that Laura and Gabe each took to achieve their success, and I think their different journeys say much about this College. Laura was Indiana’s State FFA President and has excelled not only in her agricultural economics/business coursework, but also campus leadership activities. Among many, many other leadership activities, she was President of the Barbara Cook Chapter of Mortar Board at Purdue and President of Collegiate Farm Bureau. In addition to leading from the front, she has also played a supporting role, serving as campaign manager for the successful Rust-Hiland Purdue Student Government President-Vice President campaign. Laura also played a crucial supporting role in our College’s first Ag Week development and delivery. Laura will join John Deere after graduation in May. Gabe is from Indianapolis. He has been involved in undergraduate research in the lab of Dr. Scott Briggs since his freshman year. He has spent his summers interning at the IU Cancer Center, the Howard Hughes Medical Institute, Johns Hopkins, and the Harvard School of Public Health. Gabe is a co-founder of Project HEART, a not-for-profit corporation aimed at integrating the expertise of American universities with African local knowledge and customs to empower communities for sustainable change. He will attend Harvard University in the fall on a Howard Hughes Medical Institute fellowship. An exceptional academic program – undergraduate or graduate – certainly requires terrific students, but it also takes exceptional faculty and staff who are committed to student success. My thanks to every one of you in the classroom, in the laboratory, advising clubs and organizations, recruiting, mentoring, counseling, placing, and supporting these award-winning students, and all of our 2700 undergraduates and 650 graduate students. There is no doubt you truly are preparing our students to make a difference. PS: I can't end this message without saying congratulations and thanks to all who contributed in any way to the College of Agriculture Food Drive during March. A total of 50,863 pounds of food and cash equivalent was donated this year, far exceeding the 40,000 pound goal we set for ourselves. A special thanks to the departmental leaders who came up with fun activities and challenges, and to College coordinator Luanna DeMay, who kept enthusiasm and participation high. Read all about the food drive results in the article below. The Graduate Research Spotlight highlights graduate students and their work. This month’s spotlight is on Nathan Horn, Animal Sciences; advisor Layi Adeola. 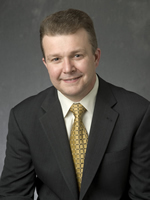 Jason Henderson, a Federal Reserve Bank of Kansas City vice president who leads the Bank's agricultural and rural outreach and research programs, has been appointed associate dean of the Purdue University College of Agriculture and director of Purdue Extension. Henderson, who earned his master's and doctoral degrees in agricultural economics from Purdue and served on the College of Agriculture Dean's Advisory Council, will begin his new role at his alma mater May 28. "Purdue has one of the strongest Extension programs in the country, and we were looking for a leader who could build on our momentum and strong state support," Dean Jay Akridge said. "We found that person in Jason Henderson. He has been instrumental in shaping the outreach programs of the Omaha Branch of the Federal Reserve, he is one of the country's leading voices on agricultural and rural community issues, and he generated widespread support not only from our search committee but also from our Extension specialists and educators during the interview process." Jan Beaty began her duties on March 12 as events manager at the Beck Ag Center. Jan is responsible for the management of building operations and will continue the ongoing work to develop, implement, and maintain policies and procedures concerning building usage and operations. Jan brings over ten years of experience working with the Purdue Residence Halls Food Service, as well as nearly four years as events coordinator at the Beck Center. To make arrangements to hold an event at Beck, please contact Jan at jhbeaty@purdue.edu or call 765-583-0590. Grocery shopping isn’t easy. That’s what 10 foursomes of Purdue students found out on April 8 as part of the kickoff for the second annual Purdue Ag Week. 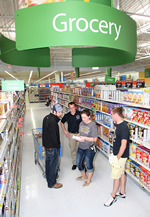 Each team was given a $100 gift card and sent to a Walmart store with the objective of shopping and planning a meal for a family of four for one week, said Brittany Haltom, executive chairperson of the Purdue Ag Week Task Force. “For 40 students, this wasn’t an easy task,” she said. “Students are used to buying microwavable meals and things like pizzas. We wanted them to think about planning meals, finding bargains and considering the nutritional value of the foods they were buying.” Elanco provided the gift cards for the “Hunger Knows No Bounds” event. Each team’s groceries were evaluated for their nutritional qualities. All of the food was donated to Food Finders Food Bank of Lafayette.The event was just one of many Ag Week activities scheduled throughout the week on campus. Faculty and staff are invited to this year's Agriculture Research Award seminar: "Does the Food Matrix Matter? 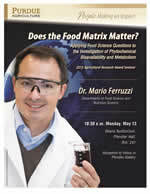 Applying Food Science Questions to the Investigation of Phytochemical Bioavailability and Metabolism" by Dr. Mario Ferruzzi, Food Science and Nutrition Science, on Monday, May 13 at 10:30 a.m. in the Deans Auditorium in Pfendler Hall. The Agricultural Research Award is the highest honor awarded by Ag Research at Purdue to mid-career faculty members and reflects Dr. Ferruzzi's contributions to research on understanding how food matrix and processing factors impact phytochemical bioavailability and bioactivity that will affect the production of functional foods to improve human health. Faculty and staff are invited to celebrate this year's TEAM Award winner, the Purdue Imprelis Herbicide Injury Response Team, at a presentation and reception on Monday, May 6 at 2:00 p.m. in the Deans Auditorium in Pfendler Hall. Lawn care companies, golf course managers and homeowners across the U.S. began using the new herbicide in the spring of 2011 and soon noticed damage to trees and ornamental plants adjacent to the treatment area. As the number of reports rose, the team was created to track and investigate consumers' complaints and to alert consumers. The College of Agriculture is committed to making ongoing improvements to policies and practices to assure that race, ethnicity and gender are not barriers to success. During the 2012 USDA Federal Civil Rights Compliance Audit it was brought to our attention that we did not have a formal tracking system in place to verify that all faculty, staff and graduate students received appropriate training. In order to comply with this requirement, all faculty and staff are required to receive training in civil rights (the regulations), diversity awareness or sexual harassment each year. The College has created a system utilizing the Qualtrics survey tool to have individuals self-report completion of their training. Rather than mandate a specific training, we are asking you to comply by recording training you have been to already or attend any training that fits your needs and interests and enhances your knowledge/understanding of diversity, civil rights or sexual harassment. You can find the College of Agriculture Civil Rights Training Self-Reporting System here: https://purdue.qualtrics.com/SE/?SID=SV_dhh6Fbs8kVNaBwx. Examples of training providers include Departments; the College of Agriculture; Purdue's Office of Institutional Equity; Division of Diversity and Inclusion; and Human Resources. Examples of training and awareness include Dr. Martin Luther King Jr. Celebration events; ADVANCE workshops; departmental diversity workshops; and harassment and discrimination prevention and response online training. 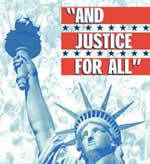 Please take a few minutes to record your completed training for 2012-2013 at the link below. If you have any questions regarding training, please contact Ag Research at 49-48462. A new lactation room is open and available in Pfendler Hall, room 213. This new room adds to existing facilities on the south side of campus in Discovery Park, Young Hall, and Lilly Hall. Thanks go to Linda Prokopy and Melissa Widhalm, Forestry and Natural Resources, for bringing the need for the facility to FNR department head Rob Swihart’s attention, and to Rob, Marlene Mann, Steve Hawkins, Tony Mull, and the Physical Facilities staff for all their work to complete the construction and equip the room. Check the May issue of InFocus for a complete list of 2012-2013 College of Agriculture faculty, staff and student awards. Mike Boehlje and Michael Gunderson, Agricultural Economics, earned the 2013 Award for Excellence in Distance Learning from Purdue Extended Campus in the category of credit-granting activity, for their online course, Interconnecting the Concepts of AGEC 684: Applied Quantitative Methods for Decision Making and AGEC 681: Economics for Food and Agribusiness Managers. 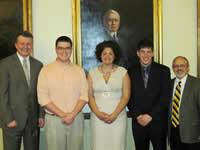 Wally Tyner, Agricultural Economics, has been named a finalist for Purdue's 2013 Morrill Award. The Morrill Award honors West Lafayette campus faculty for outstanding career achievements. Candidates have excelled at all facets of the professoriate and will have demonstrated synergies between their roles as teachers, scholars and any aspect of the engagement mission by evidencing the impact or potential impact of their work on society. Dr. Vic Lechtenberg was the first Morrill Award recipient in 2012. Anna Anderson, account clerk in Botany and Plant Pathology, was one of three employees who received the 2013 Eleanor Kaplan Award for Exceptional Customer Service. The Kaplan Award was created in 1996 to recognize administrative and clerical staff in Business Management who demonstrate excellence and leadership in providing customer service. Carol Brock, Office of Academic Programs, received a Rose Award from the Barbara Cook Chapter of Mortar Board. The Rose Award goes to clerical or service staff who positively affect those around them and go above and beyond the call of duty. These awards are given by the chapter to clerical and service staff workers nominated by faculty, staff, or students. The award is a dozen roses. Honorees are always surprised by members of the chapter greeting them at work. Carol is shown here with Laura Donaldson, senior in Agricultural Economics, who presented the award. Amy Wright and the Pre-Awards Center staff received a "Thumbs Up" acknowledgement from Associate Dean for Research Karen Plaut: "Amy Wright and her pre-awards staff support the colleges of Agriculture and Veterinary Medicine faculty in grant submissions. They work with faculty to make sure that they have met all the criteria for their grants, help them prepare budgets and prepare the document package, read it over and then submit it to the funding agency. They go above and beyond the call of duty as they often work tirelessly late into the evening to make sure that the grants are submitted on time and meet all the criteria that are essential for the grant to be accepted by the funding agency. They do this over and over, often submitting almost 100 grants per month to many different funding agencies. Their service is second to none. They are unsung heroes for their efforts on behalf of the faculty,"
Dean Jay Akridge and Associate Dean Marcos Fernandez pose with (l-r) Gabe Rangel, Biochemistry, the 2013 G.A. Ross Award for Outstanding Senior Man winner; Laura Donaldson, Agricultural Economics, the 2013 Flora Roberts Award for Outstanding Senior Woman winner, and Jackson Troxel, Agricultural Economics, who won the 2013 France Córdova Outstanding Leadership Award. Emily Czyszczon, a senior in Agricultural and Biological Engineering, was one of the speakers at TEDxPurdueU in April. TED is a nonprofit organization devoted to "ideas worth spreading". Started as a four-day conference in California, TED has grown to support world-changing ideas with multiple initiatives. TEDxPurdueU strives to nurture a culture of innovation by sharing state of the art ideas developed by Purdue students, faculty, and alumni with the global TED community. Purdue’s Collegiate Beef Cattle Association earned second place in the Animal Agriculture Alliance's fourth annual College Aggies Online (CAO) scholarship competition. The nationwide program was developed to help college students utilize social media to share agriculture's story. CAO participants earn points by writing weekly blogs, sharing photos and videos related to agriculture, and hosting events on their campuses. This season, CAO participants were challenged to engage the public utilizing Twitter, Facebook, Pinterest and LinkedIn as well as traditional media. The Midwest Cover Crops Field Guide won the Gold Award (highest level) for technical publications from the Association for Communication Excellence (ACE). ACE is an international professional organization primarily composed of agricultural communicators. Congratulations to Eileen Kladivko, Corey Gerber, Kevin Smith, and the entire Midwest Cover Crops Team on this award. The Purdue Master Gardener Manual won the Gold Award (highest level) for one- to full-color popular publications from the Association for Communication Excellence (ACE). ACE is an international professional organization primarily composed of agricultural communicators. Congratulations to Mary Welch-Keesey, consumer horticulture specialist (retired) and lead author. Congratulations also to the manual team and the many contributors and reviewers, including Kevin Leigh Smith and Tim Thompson, Purdue Agricultural Communication, and Rosie Lerner, consumer horticulture extension specialist. Purdue Extension has resources to help homeowners recover from problems brought on by floods. The publication First Steps to Flood Recovery is available free at local Purdue Extension offices and online at http://www.extension.purdue.edu/floodpub/. The publication has information on how to take care of people and animals during and after a flood, how to enter a flooded building and salvage damaged property, and how to handle food contaminated by floodwaters. Additional resources are available from the Purdue Extension Disaster Education Network at http://www.ag.purdue.edu/extension/eden/Pages/flood-info.aspx. Topics include how to deal with flooded wells, how to prevent mold, and how to remove water and clean flooded basements. More information on flood preparedness and recovery also is available by contacting local Purdue Extension offices at (888) EXT-INFO. Also, a directory of Extension offices is available at http://www3.ag.purdue.edu/extension/Pages/Counties.aspx. Indiana residents are overwhelmingly receptive to wind farms in their communities, even in areas that have rejected turbine development, according to studies led by Linda Prokopy, associate professor of natural resources planning in Forestry and Natural Resources. Prokopy said much of the research on attitudes toward wind energy and wind farms has focused on coastal states and the reasons people don't want turbines in their communities. She and Kate Mulvaney, a former graduate student, published two studies in the journals Energy Policy and Environmental Management. One focused on Benton County, Indiana, which has embraced wind farms. The other study compared Benton County with two other Indiana counties - Boone County, which rejected wind farm development, and Tippecanoe County, which at the time was still considering wind farms. The researchers conducted surveys and interviews and studied local newspaper articles on wind energy. A historical analysis of corn research shows that new hybrids are taking up more nitrogen than older plant varieties after the crucial flowering stage, a clue as to how plant scientists will need to adapt plants to increase yields. Tony Vyn, professor of agronomy, and Ignacio Ciampitti, a postdoctoral research associate, are studying the timing of nutrient uptake in corn and how that process affects yield. They found that modern hybrids (post-1990) took up 27 percent more total nitrogen from the soil after flowering than pre-1990 corn plants. In fact, nitrogen uptake after flowering in post-1990 hybrids averaged 56 percent of the total grain nitrogen at the end of the season. Exposing packaged liquids, fruits and vegetables to an electrical field for just minutes might eliminate all traces of foodborne pathogens on those foods, according to study led by Dr. Kevin Keener, Food Science. Keener looks for new ways to kill harmful bacteria, such as E.coli and Salmonella, that contaminate foods and cause serious illnesses and deaths. Keener’s method to kill harmful bacteria that contaminate foods and cause serious illnesses and deaths uses electricity to generate a plasma, or ionized gas, from atmospheric gases inside the food package. This process creates a wide variety of bacteria-killing molecules including ozone, nitrogen oxides, hydrogen peroxide and others. These molecules only exist for a few hours and then revert back to the original atmospheric gas, leaving a bacteria-free product. The Indiana Biomass Energy Working Group will host a spring session to highlight anaerobic digester technology on April 23 in Middlebury. The session includes presentations by Purdue Extension and industry experts, as well as a tour of the Culver Duck anaerobic digester. "A primary mission of the working group is to showcase biomass energy projects around the state," said Chad Martin, Purdue Extension renewable energy specialist. "Culver Duck used to have to pay to dispose of offal waste, but the anaerobic digester now allows them to commingle that with corn stover to create biogas. The electricity generated by the facility is then purchased by the local power company." Jiqin Ni, Agricultural and Biological Engineering, will also present a session on Anaerobic Digester Technology. Purdue and Ohio State universities have redesigned the website of their Ag Answers news service, adding capability for multimedia components and other resources to help farmers better manage their crops, livestock and marketplace transactions. Ag Answers, a partnership between the Extension services of both universities since 1995, provides timely agricultural problem-solving advice for farmers involved in production agriculture, small farms, horticulture and local foods. The redesigned site, at http://www.aganswers.net, was launched on April 1. The Purdue Alumni Association is seeking nominations for the 2013 Special Boilermaker Award. Established in 1981, the Purdue Alumni Association Special Boilermaker Award honors a member of the Purdue faculty or staff who has contributed significantly to the improvement of the quality of life and/or the betterment of the educational experience for a substantial number of Purdue students. The winner will be selected by an award selection committee and will receive a Boilermaker locomotive train, be recognized at a home football game, and have their name inscribed on the recognition obelisk on Purdue Mall. Nominations are due by June 1 and should include a completed nomination form. More information about the award along with the form is available at http://purdue.imodules.com/s/1461/2column.aspx?sid=1461&gid=1001&pgid=551. This memo from Daniel Hasler, president and chief entrepreneurial officer of Purdue Research Foundation, is regarding a six-month "Innovation Assessment Process" designed to expedite the transfer of life-changing Purdue discoveries to the public. The memo was sent to List 39 on April 2. Doctors, teachers, employers, neighbors and other members of the community now have expert advice available to help them support military families, thanks to a partnership between Purdue University's Military Family Research Institute, several federal agencies, and the National Military Family Association. The Department of Defense, in partnership with the Department of Agriculture (USDA), on April 15 unveiled the "How to Help Military and Veteran Families" series at an event at the Army& Navy Club in Washington, D.C. The launch was scheduled in coordination with the 2-year anniversary of Joining Forces, first lady Michelle Obama's initiative to support military families. The U.S.-China EcoPartnership for Environmental Sustainability at Purdue is launching a travel grant program through the Purdue-China Visiting Scholars Network, awarding up to eight travel grants valued at $4,500 each. The travel grants, which will be awarded this spring, are designed for graduate students or postdoctoral researchers wanting to partner with colleagues in China, said Tim Filley, a professor of earth, atmospheric and planetary sciences at Purdue and director of the U.S.-China Ecopartnership for Environmental Sustainability (USCEES).